Tino Troy formed his 1st band with Pete Moore another guitarist. Somewhere around here Tino persuades Chris to join the band who are currently called "Junction". The band at the time were playing one off gigs in Youth clubs. The band now called Mantis start to get dates in Pubs. The Band record the 3 track demo that would eventually be released in 1980 as "Soundhouse tapes Part 2" (Part 1 being 3 tracks by Iron Maiden). A friend Paul Williamson (who was Lyricist for Johnny Cool and Praying Mantis) advises Tino to take the Tape to DJ Neal Kay at the Soundhouse Club. Neal Kay is impressed with the demo and asks the band to play the club. On 9th November 1979 BBC Radio 1 broadcast a Praying Mantis session on the Friday Rock Show. This featured "Captured City", "Lovers to the Grave" and "Johnny Cool". Bands doing sessions for the BBC are usually given ½ a day to record their tracks in a BBC studio. The session was recorded 31st Oct 1979. The recording line-up was Tino Troy, Chris Troy, Pete Moore and Chris Hudson on drums. A Mantis Gig at the Marquee Club in London was recorded by someone and is available on bootleg. This contains an tracks called "Rock and Rock Fever" which I am told is an embryonic version of 30 Silver pieces. I have given both a listen and I don't think it is but I am prepared to be wrong. Captured City is recorded for Metal for Muthas with a session drummer who only had two and a half hours to learn the arrangement. February 15th 1980 Captured City, the Soundhouse tapes part 2 single is released on Ripper Records. It is dated as 1979 and the Troy's are credited by their real surname, Neophytou. It sells 15,000 copies in two and a half weeks. The Band tour with Iron Maiden and Neal Kay on a Metal for Muthas tour. On the way to a gig in Bristol on this tour the Equipment truck overturned and Mantis had to borrow gear from the band 3rd on the set that night Dedringer. The Mantis set had to be shorten to 30 minutes to fit everyone in and the crowd wanted an Encore. Mantis has to just go back and thank them. Rainbow and Praying Mantis both decide they would like to release "I surrender" as a Single. Rainbow being the Bigger band get the go ahead. Mantis's version has yet to be released. During March Mantis play some gigs with Gamma and some on their own. "Time Tells No Lies" was eventually released after a couple of delays by the record company. Shortly after the release of the first LP, they recruited Tom Jackson as a vocalist and existed as a five piece for several months. Doing more dates in June and July. In August Mantis were due to play at the Reading Festival again but got stuck in Germany due to a mix up with the Airline company. They play Third on the bill at a Dutch Open Air festival. The headliners were Dexy's Midnight Runners!!!!. Second on the bill were Tygers of Pang Tang. Mantis go down extremely well. On September 20th Mantis headline an East Anglian Rock festival. Mantis play the Marquee, London as a prelude to their Reading Festival appearance the set was as follows. The Turn the Tables singles is released to coincide with the bands appearance at the Reading festival in England. It contains Tell me the nightmares wrong which was written by Gary Partn who is best know for the Theme tune for TV series "Cheers". M.G.MacMillan tells me "The Turn the tables EP was originally intended to have four tracks, but only Turn the tables, Tell me the nightmare's wrong and A question of time made it onto vinyl. The fourth track recorded in those sessions was Give me a reason." Steve Carroll leaves the Band when the band has problems with their management company Fireball. The band was basically dead at this point and Steve was friends with one of the Managers and did not feel he could carry on. M.G.MacMillan tells me "PM were scheduled to record an LP for Jet in early 1983. Although studio time was booked, I'm not convinced any recordings took place. The LP was originally to be called either Turn the tables or A question of time. There was also to be a tour of the U.S. supporting Black Sabbath. However, since Sabbath didn't make it over until October, this obviously never took place." This sounds very similar to the second 1981 album. M.G.MacMillan Continues in May 84, they were forced to change name because of copyright problems with the 'Escape' bit. Here's where somebody has got the wrong end of the stick...it was at THIS point that they briefly adopted the name Tigon (not Tygon), which also fell victim to legal difficulties. They finally became Stratus in July 84. The band was comprised of Bernie Shaw (v), Tino Troy (g), Chris Troy (b), Alan Nelson (K) and Clive Burr (d). Stratus released the Throwing Shapes LP but it didn't get a UK release, it was just released on the Belgian Steel Trax label and also had a Japanese pressing. The Line Up was as the album except Alan Nelson was replaced by Steve Mann of Dennis Stratton's Lionheart. It's a very small world. In 1987 Mantis reformed for a one of gig. The line-up was Troy's, Bernie Shaw, Dave Potts and Hugh Bestick on rhythm guitar. Hugh was a school friend of Tino's and Tino was trying him out but it did not work because he could not sing. See The Mantis in the Press page for a review of the gig. The whole of this period between the end of Stratus and the start of the 90's Mantis Tino Troy spents playing in pub bands. April 1990 Praying Mantis reform for a short visit to Japan. They record a Tokyo gig which is released as "Live and Last" in Japan and USA. Predator In Disguise is recorded and released in Japan. It is later given a UK release. Gary Barden sang "Can't Wait Forever", but his version was not included in "Predator in Disguise" album. Hence the "On The Subs Bench: Garry Barden , Ten out of ten for effort" comment on the album cover. Gary has said his version stored somewhere in London. Thanks to Ko Yamada [BYQ05551@niftyserve.or.jp] for this information. M.G.MacMillan tells me "Captured city appeared unintentionally on the Heavy Metal records 'NWOBHM' retrospective compilation LP in 1991. Credited on the sleeve as 'Ambitions' by Dragster, I'm reliably informed that this is a unique version! How this happened is a complete mystery, since PM were never signed to Heavy Metal at any point and they didn't have the rights to this track. Bizarre, to say the least." Promotional Videos are record for "This time Girl" "Border line" and "Can't see the Angels"
"A Cry for the New world" is released in Japan and the UK. Colin Peel is now the vocalist. The Band record a video for "Dream On" in the UK. Apparently it shows a bit of "Dennis's pub, when he was doing that" at the begining. Colin Peel leaves the band to perform in a Musical called "Hair"
However because Colin Left, it was changed to. Probably on 26 May 1993, Chris Tino and Dennis appeared on a TV show called Mutoma World talking about the Colin situation and playing Dream on (Chris Lead Vox) and A moment in Life (Dennis Lead Vox) acoustically (just two guitars) live. Mantis tour Japan for a 4th time and on 11 & 12th November 1995 record two concerts at Club Citta Kawasaki, Japan for use on "Captured alive in Tokyo city"
A Promotional Video for "Welcome to my Hollywood" is made. Praying Mantis return to Japan for their '95 Tour with what must be their strongest ever line up. Gary Barden, the lead vocalist who features on the latest album 'To The Power of Ten', now performs for the first time since playing the Budokan with the Michael Schenker Group in 1981. 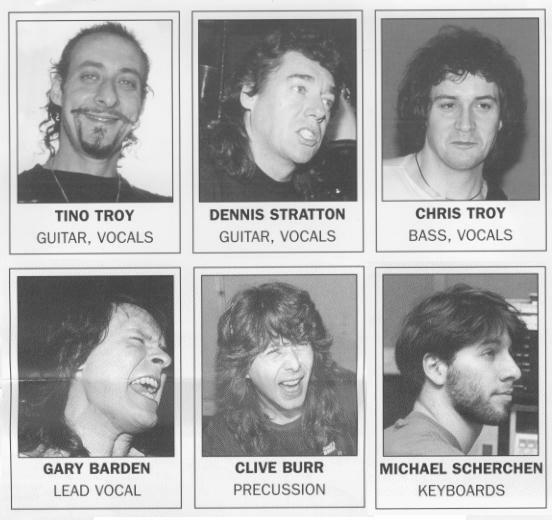 Clive Burr, on percussion, formerly of Iron Maiden and Dee Snider's Desperado, is no stranger to Tino and Chris Troy, as they performed together on the Stratus project album, 'Throwing Shapes'. The guest keyboard player on this tour is Michael Scherchen who assisted the band in the studio during the recording of 'A Cry For The New World' and 'To The Power of Ten'. His vast knowledge of music and electronic wizardry, together with his intimacy with many of the songs in the set, have made him the ideal choice for this tour. The set list for the shows is certainly formidable with an immense repertoire from which to choose. Songs are taken from the albums 'Time Tells No Lies', 'Predator in Disguise', 'A Cry For The New World' and obviously, the most recent release 'To The Power Of Ten'. The combination of Gary Barden's powerful, melodic vocals, the harmonious guitar work of Tino, Dennis and Chris, against the thunderous, insistent beat of Clive on drums produces a unique and exciting sound. Praying Mantis have evolved over many years and the lineup with it. WE believe we have found the right formula. Tonight YOU be the judge. "Captured Alive in Tokyo City" is released on Video, single CD and limited edition 2 cd. Mantis part company with Gary Barden. The current singer is Tony O'Hora. He at least recorded a 5 track Demo with the band Early in 1997. The tracks are all Mantis originals with the following titles. Bruce Bisland is also expected to be back for the next album although on this demo it was a drum machine. The Full Band played four dates in Japan. It was the first time the band that recorded an album had actually toured it! Work began on the Nowhere To Hide album which was hoped would be released in Nov 99 but ended up being finished in February 2000. Perform In London and Japan with the Original 1980 Line up of Dave Potts, Steve Carrol, and they Troys. The Japanese date was recorded for the Various Artist Metal Crusade 1999 Live album. The Band privately celebrate 10 years of the core lineup of the Troys, Dennis Stratton and Bruce Bisland with a party and short set at Dennis's local Pub in London. Nowhere To Hide Is Released In Japan. For once there is no Promotional Trip. "The Journeys goes on" is released.